With the holiday season fast approaching we know how crazy things become and how limited your time becomes with all of the hustle and bustle. Let us help you spread some holiday cheer and capture the spirit of the season this year. Whether you are looking for a simple Christmas lighting display or looking for something more complex we can design a holiday lighting display to fit your needs. We are open year round and encourage you to plan early especially as it relates to designing a display that will meet your family's expectations. We would love to prepare a free no obligation estimate for you today. We start installing holiday lighting and Christmas decor beginning October 1st. Our installation includes all needed clips, extension cords and a timer. After we design your holiday lighting arrangement, we’ll move swiftly to install the display, so you can enjoy your shining lights for the duration of the season. We can hang lights in places that are hard to reach, such as high points on homes and buildings, and in mature trees. Once installed, your lighting arrangement will be highly durable for the brisk winds of winter. ​Most holiday lighting display are operated for a short period of time and don’t require maintenance or repairs during the holiday season. However, if maintenance or repairs are needed, we’ll jump into action and perform the work as quickly as possible. We know that installing holiday lights is about creating a amazing scene, and non-working lights aren’t a part of the equation. See our FAQ's page related to bulb options to make sure you are selecting the bulb that is right for your holiday lighting display. We will take your lights down as professionally as we installed them. We start removing lighting displays and holiday decor starting January 2nd. Our goal is to get all of our clients lighting and displays removed and packed away by January 31st. If you have a specific date that you would like your lights removed on or by please let us know at the time of installation and we work to accommodate your needs. Our service includes storing your entire lighting display in our warehouse to carefully preserve it for the next holiday season. ​One of our holiday lighting services that our customers appreciate the most is our re-installation of a well-maintained lighting arrangement year after year. The display is already designed. All we have to do is take it out of storage, perform any necessary maintenance, and install the display like we did the year before. Reinstalling a display is highly cost effective compared to creating a new display. Whether you're looking for something simple and fun, classic or extravagant we are the company to call. As one of the leading holiday lighting company's in St. Louis we are ready to help you with your Christmas lighting needs. The best part? Holiday Lighting STL will take down your decorations after the holidays and store them for you until next year at no additional charge! ​Prices vary depending on the size of the home, roof material and slope, height of home, landscaping around the house, and size of trees. 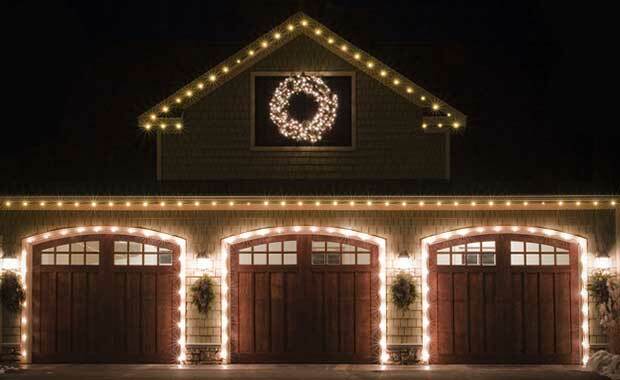 We warranty the lights and all decor each year for no additional cost. We offer two discounts, 10% discount for customers who allow us to install during the month of October and another 10% discount for returning customers.